The FWCC membership consists of providers, users, and manufacturers of terrestrial Fixed Service radio communications services and equipment. The Fixed Service uses microwave radios to transmit voice and data between fixed points. 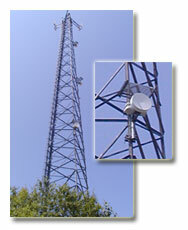 Our members operate the familiar, horizontally-aimed "dishes" perched on towers and buildings throughout the country. Although largely unnoticed by the public, these systems are vital to the Nation's infrastructure. They regulate the oil and gas moving through pipelines, control the distribution of electricity, and govern the movement of trains. These systems forward police, fire, and ambulance calls to emergency responders. They deliver television signals from stadium to studio, from studio to transmitter, and from transmitter to cable systems. Our members' systems transmit long-distance telephone calls, data, and Internet traffic, and connect cellular base stations into the telephone network. They deliver "wireless cable" video to homes, and bring local phone calls and broadband Internet service to homes, schools, and businesses. The FWCC was formed in 1998 to provide a voice for the Fixed Service community. The original impetus was an escalating reallocation of Fixed Service radio spectrum to new satellite and mobile services, notwithstanding ever-increasing demand for Fixed Service operations. That created an urgent need for a strong, clear voice representing the Fixed Service. The FWCC has continued to represent the Fixed Service community, not only on spectrum matters, but on frequency coordination and technical issues as well. We have made scores of filings in many FCC (Federal Communications Commission) proceedings, and meet often with the FCC staff. When necessary, we participate in court proceedings as well. The FWCC meets by conference call on the first Thursday of every month. Between calls, an active email exchange keeps members informed about pertinent regulatory issues and serves as a forum for discussion. The FWCC is incorporated in the U.S. state of Delaware.